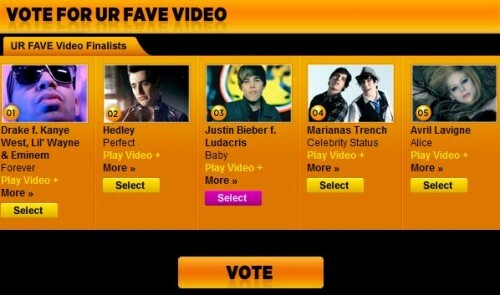 Let’s hope JB gonna win this time. Note: you can only vote 1 time for each category. Click here to read Justin Bieber didn’t win Juno awards in Canada! all i have is a good personality. all i got to someone is love. all i have is a good heart and personality. See BIEBER LIVE and GET 2 MMVA 2010 WRISTBANDS, hotel and travel provided with Meal Exchange’s video contest!!! Go to http://www.facebook.com/mealexchange for more contest information. i already voted for bieber. i already voted for him! I HOPE HE WINS… I REALLY REALLY REALLLLLLLLLLLLLLLLLLLY DO! :)! P.S. WHEN SOMEONE SAYS SOMETHING BAD ABOUT JUSTIN, JUST REPLY TO THEM AND CALL THEM A JBHATER, LET’S PLZ NOT USE NASTY WORDS. I LOVE JUSTIN BUT 2 EXPRESS MY FEELING I WOULD NEVER USE WORDS THAT R HURTFUL… THANKS, BEILEBERS! YEAH VOTE FOR HIM I VOTE FOR HIM!! !